Many kitchen cupboard layouts have deluxe pantry designs that were born from creative cabinetry makers developing new ideas. Slide-out baskets, roll-out shelves, swinging piano hinged can-good storage, butler’s pantries and lazy susans are common options when designing your tall kitchen storage areas. There are many selections available from production manufactures or pre-fabricated cupboard supply companies. If you’re having your cabinetry custom built, the design possibilities for tall storage units are endless. 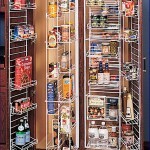 By looking at various ideas you can pick, choose and design the ultimate pantry for your kitchen. 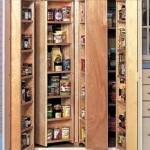 The photos below will give you several ideas for your kitchen pantry cabinetry. Most manufactures offer these tall units in standard designs. The least expensive is always going to be the standard adjustable shelf style. The most costly arrangement will be the swing-out shelves with the roll-out drawers installed behind. Although these designs fit the more present day styles, they can be incorporated into a butler’s pantry cabinetry design. The retail purchase price of these units are somewhat costly but worth the investment. They come with adjustable height bars on the front and back of the units. You will also discover that there are several basket sizes available that make this sliding mechanism very versatile. 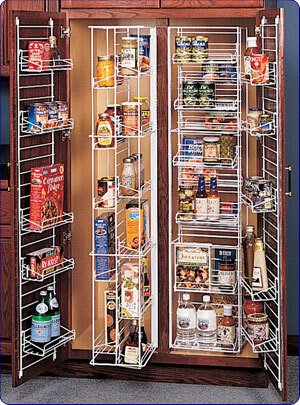 Actually, these pantry cabinet designs are often available from mass production facilities. To have a custom cabinet maker manufacture build these swinging piano hinged can good shelves is going to be an expensive proposition. They are extremely labor intensive when they are custom designed and fabricated. 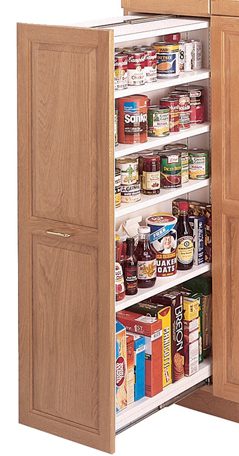 Of all the kitchen pantry cabinet designs, this is the one that I am the most partial to. Custom cabinet companies can work directly with the customer, during the design process, to develop a high-in cupboard perfectly suited to the customers needs. By this, I mean that drawer heights and placements can be perfectly designed for tall cereal boxes, pickle containers or ketchup and mayonnaise jars, different heights of canned goods and plastic wrap or trash bag storage. These units are usually available in a fixed size and screwed onto the backside of the tall kitchen cabinet doors. 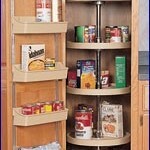 There are many combinations that could work with the pantries design. For instance, there could be adjustable shelves cut short to accommodate for the depth of the baskets or wire swing-outs can be installed like in the above photo. 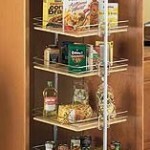 Here is another great idea for pantry storage. It is a custom built unit that has adjustable shelves. The heavy-duty full extension drawer slides mounted at the top and bottom of this tall roll-out shelf unit allows for a very smooth operation. Here again this slide out would be rather costly. Designs like this one are very labor intensive. These plastic turn table units come in various widths. 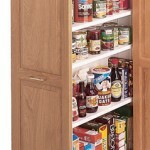 They are ideal for a pantry that is angled and setting in a corner. 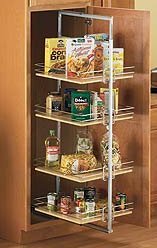 Generally tall angled pantry corner cabinets are custom fabricated. With an angled application, the door is usually very small; so, these adjustable height tall lazy suzans are the perfect solution for tight spaces. 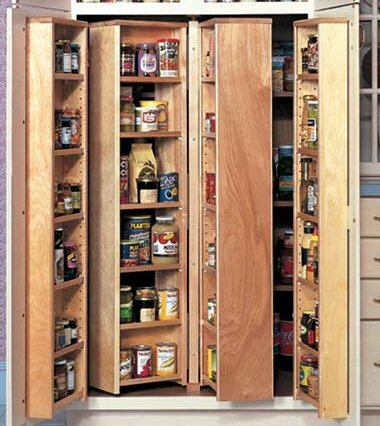 These are just a few of the ideas that can be gleaned from when designing a kitchen pantry cabinetry. Sometimes the investment of money that it cost to customize these tall storage units is more than customers are willing to spend. 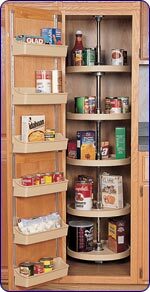 One of the greatest benefits to having these special designs like pull-out baskets, shelves or drawers installed in the kitchen cupboards is that they eliminate a lot of reaching and even stooping that causes back pain to be enhanced.